Ashes touring books during the interwar years were a little more frequent than before 1914, at least one contemporary account appearing for each series bar one. Bodyline was a notable exception, but the real proliferation did not happen until the 1950s, when the 1954-55 tour for instance attracted ten full accounts. In contrast the first Ashes series after the Great War – England in Australia 1920-21 – attracted just one contemporary account, that the one was perhaps one of the best Ashes tour books written was simply a case of serendipity. Defending the Ashes was written by P.G.H. Fender who was widely considered the greatest English captain never to captain England. The book gives fascinating insights into both the cricket and the tactics of the time and after reading the book it confirms Fender’s claim to the English captaincy. Unfortunately England, after the ravages of war, became the first, and until the 21st century, the only team to lose an Ashes series 5-0. Tests at this time in Australia were played to a finish and there was no hope of rain or a dour rearguard action to secure a draw. In effect there was nowhere to hide for England against Warwick Armstrong’s all conquering team. The English winter of 1924/25 brought another Ashes tour and again just one contemporary account, this time by former Australian captain Monty Noble. Gilligan’s Men is written in the Fender vein and although not quite reaching the same heights it is still a thought provoking account of a tour that showed the first signs of England recovering after the effects of the Great War, despite Australia winning four Tests to one – the main reason being the pairing of England’s and perhaps cricket’s greatest opening pair in Jack Hobbs and Herbert Sutcliffe. Hobbs and Sutcliffe, together with a player who made his Ashes debut in 1899, one Wilfred Rhodes, led England to a 1-0 victory in 1926 and their first Ashes win since 1912. This series, perhaps because of England’s success, attracted three accounts all released in 1926. Collins’s Men by the English captain of the previous Ashes series Arthur Gilligan, Those Ashes by Monty Noble and The Fight for the Ashes by Plum Warner. All three are well worth a read. A now rejuvenated England visited Australia in 1928-29, coming as close as they ever have to winning an Ashes series 5-0. However they were thwarted in the fifth Test by a young man called Bradman, who helped Australia to a narrow victory and the saving of a whitewash. Criticisms of Bradman’s technique and prophecies of his failure on England pitches in Fender’s book, the aptly named Turn of the Wheel discredited one of the best, if not the best tour book written, although Monty Noble’s The Fight for the Ashes is also a well constructed account of the series. Bradman’s technique held up well during the 1930 tour as his 974 runs suggests and Fender is generous in his praise of the “Bowral Boy’s” magnificent tour in his book The Tests of 1930. England’s defeat is also covered by Warner in The Fight for the Ashes and the Australian author Geoffrey Tebbutt With the 1930 Australians. Unfortunately I have not had the pleasure of reading either. With Bradman the batting wonder Australia was expected to dominate the 1932-33 Ashes series; however with Douglas Jardine and a bevy of fast bowlers employing fast leg theory (Bodyline) England not only won the series four Tests to one, they gave publishing the most written about contest in cricket history. To list just all of the contemporary accounts, none of which are top shelf, would take up too much space. The two best accounts were written after the tour, those being Cricket Crisis by Jack Fingleton in 1946 and Cricket Web’s book of the decade Bodyline Autopsy by David Frith. It is a pity that Percy Fender did not travel to Australia and write a book on the tour. Fender was a proponent of the tactics of Jardine and his opinions after watching the series may have been his greatest legacy to cricket literature. Fender was back to his best in his coverage of the 1934 tour with the strangely named Kissing the Rod, as Bradman and Bill Ponsford batted and batted to see Australia win back the Ashes. Two other books were written about the series Douglas Jardine’s Ashes and Dust, and Jack Hobbs’ The Fight for the Ashes. Again I have not had the pleasure of reading either offering. By 1936-37 Bradman was captain and, after trailing 2-0, he led Australia to a 3-2 victory – the only time in Ashes history where a side has comeback to win after trailing by two Tests. Neville Cardus wrote an entertaining account of the series called Australian Summer, other books written at the time were So This is Australia by William Pollock and Australian Test Tour by Bruce Harris. Once again I have not had a chance to read either. 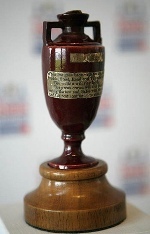 The final series before the start of WWII saw Australia retain the Ashes with a one all draw. A rather dour series and the impending threat of war saw no contemporary book written on the tour, although in 1949 an anthology of the work of Neville Cardus Cardus on Cricket included all of the great scribe’s daily press reports from the Test matches. Finally in 1991 a full tour account appeared, Barry Valentine’s Cricket’s Dawn That Died. Yet another one I am yet to tackle, however the title is interesting.